BOGO FREE ICE CREAM @ CREAMISTRY FOR BLACK FRIDAY! - EAT WITH HOP! Home / DEALS / DESSERT / FREE / ICE CREAM / LIQUID NITROGEN / BOGO FREE ICE CREAM @ CREAMISTRY FOR BLACK FRIDAY! DID EVERYONE HAVE A GREAT THANKSGIVING SO FAR? IT'S BLACK FRIDAY NOW AND HOPE Y'ALL ARE GETTING AWESOME DEALS TODAY ^__^ ! I WON'T REALLY BE SHOPPING FOR BLACK FRIDAY BUT I WILL BE TRYING TO CATCH THE GUDETAMA x PLAN CHECK COLLAB TODAY! 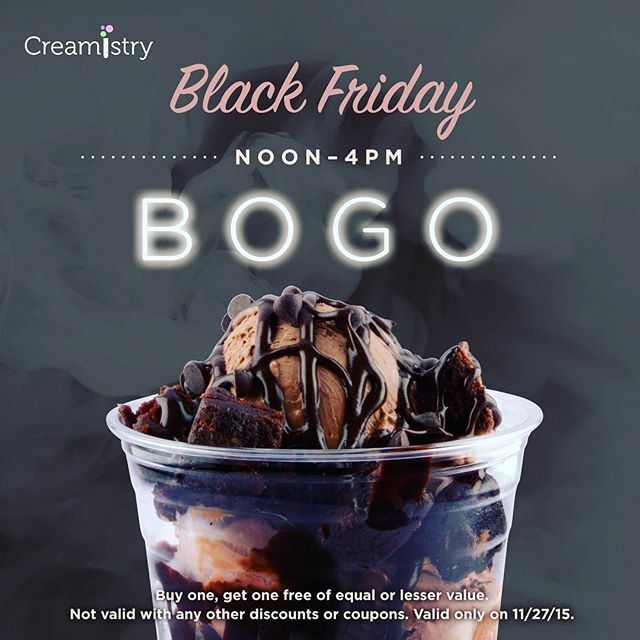 CREAMISTRY is giving out BUY ONE GET ONE FREE deals today for BLACK FRIDAY from 12pm - 4pm. Get ice cream and get a milkshake for free! Or just get 2 milkshakes or 2 orders of ice cream! As long as its of equal or lesser value! **It is confirmed that their Triangle Square (Costa Mesa) location and Temecula location will be having this deal since I saw their official social media accounts posting it. The photo itself though, doesn't have any detail about location so this might mean that this deal is available at all locations...but again, I am not sure.